Head Jog have combined the latest technology with the Hottest colour, To bring you the Head Jog PINK Radial Collection! This gift set offers style and functionality with the very highest quality/standard of all ceramic/ionic radial brushes. 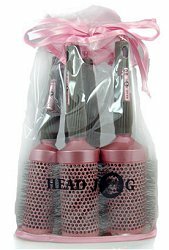 Head Jog Professional Pink Ionic bristle radial hair brushes with Ceramic coated barrels have vent holes that allow warm air to circulate at the roots of the hair, allowing fast & effective blow-drying & styling all at the same time. The brushes also have ergonomically designed handles for easy grip & maximum control. * Ionic Ceramic eliminates frizz and creates silky smooth hair. * Heat is evenly spread so hair dries faster. * Damaging effects from excessive blow-drying are eliminated. * Ceramic emits negative ions when heated and assists in breaking-down bacteria build-up. * Hair is healthy, freshly conditioned with renewed vitality.